When we set goals, it is always with high expectations and good intent. However, a few months into the year, after the initial motivation is gone, many will struggle to stay on track.What we are missing is a solid plan of action to guide and motivate us so we stay on the path to achieving our goals. 1. Identify what you want. We often don’t reach our goals because they are not what we want, but what others say we should want. For example, you may feel compelled to focus on boosting your retirement savings because that’s what your peers or colleagues are doing; however, you’re actually more concerned about eliminating your credit card debt or paying off your mortgage. Although it’s possible for you to increase your retirement account contribution while you pay off debt, if creating a debt-free lifestyle is your goal, make reducing debt your top priority. 2. Assess your financial situation. Once you’ve set your priorities and know what you want to achieve this year, review your complete financial situation. Include your most recent bank, investment and debt statements and include other financial information you deem important.The objective is to obtain a complete understanding of your income and expenses so you can create realistic financial goals. I will eliminate the $10,000 debt on three credit cards within three years. In 2019, I will eliminate debt on the card with the highest interest rate, which carries a balance of $5,000. Each goal states specific and written monetary amount sand the time frame in which you plan to achieve the goal.Example one takes the process a step further specifying a milestone to achieve in the first year in addition to the long-term goal. 4. Make a plan. Once you’ve specified your goal, create a plan to make it a reality. Instead of trying to create the perfect plan, focus on defining the activities you will do to reach your goal. 5. Place a visual reminder of your goal in sight. Having your goal in clear view daily is a powerful reminder and motivation for what you want to achieve. • A budget. A budget will provide a visual representation of your spending activities, income and expenses. If you’re looking for ‘extra’ money, identify ways to reduce your expenses, specifically non-essential expenses that tend to add up, such as frequent restaurant dining, online shopping splurges, etc. • Expenses. Closely tracking your expenses helps you commit to your budget and ensures you have extra money to apply toward reducing your debt or increasing your savings. • Defined steps to achievement. 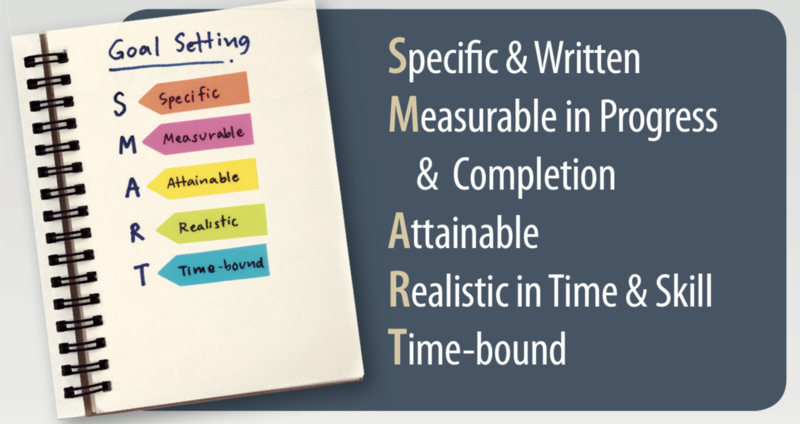 Create a specific plan with defined steps to achieve your goals. I will apply an extra $500 per month to the payment of the highest-interest card until it is paid off, while continuing to make the minimum payment on the other two cards. I will stop using the card while I’m paying it off. Discuss your financial goals with a professional you trust. If you are looking for a reputable financial professional, give us a call, we will be happy to give you a referral.